The massive Tambora stratovolcano forms the entire 60-km-wide Sanggar Peninsula on northern Sumbawa Island. The largely trachybasaltic-to-trachyandesitic volcano grew to about 4000 m elevation before forming a caldera more than 43,000 years ago. Late-Pleistocene lava flows largely filled the early caldera, after which activity changed to dominantly explosive eruptions during the early Holocene. Tambora was the source of history's largest explosive eruption, in April 1815. Pyroclastic flows reached the sea on all sides of the peninsula, and heavy tephra fall devastated croplands, causing an estimated 60,000 fatalities. The eruption of an estimated more than 150 cu km of tephra formed a 6-km-wide, 1250-m-deep caldera and produced global climatic effects. Minor lava domes and flows have been extruded on the caldera floor at Tambora during the 19th and 20th centuries. Astronaut photograph ISS020-E-6563 was acquired on June 3, 2009, with a Nikon D3 digital camera fitted with an 800 mm lens, and is provided by the ISS Crew Earth Observations experiment and Image Science & Analysis Laboratory, Johnson Space Center. The image was taken by the Expedition 20 crew. The image in this article has been cropped and enhanced to improve contrast. Lens artifacts have been removed. The International Space Station Program supports the laboratory to help astronauts take pictures of Earth that will be of the greatest value to scientists and the public, and to make those images freely available on the Internet. Caption by William L. Stefanov, NASA-JSC. 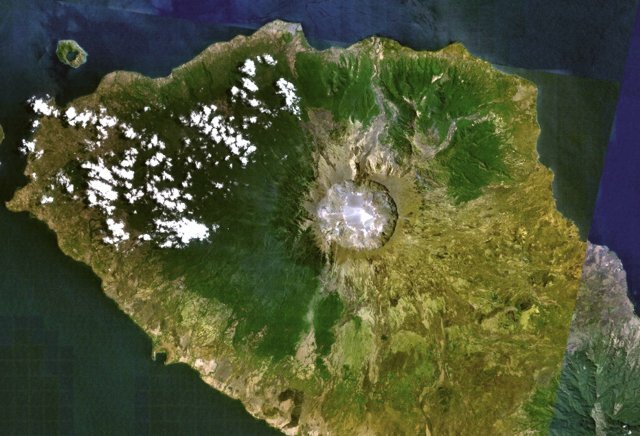 This detailed astronaut photograph depicts the summit caldera of the volcano. 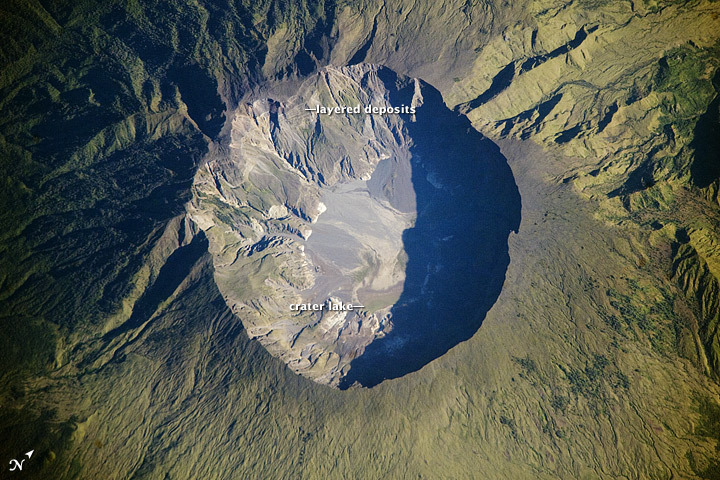 The huge caldera—6 kilometers (3.7 miles) in diameter and 1,100 meters (3,609 feet) deep—formed when Tambora’s estimated 4,000-meter- (13,123-foot) high peak was removed, and the magma chamber below emptied during the April 10 eruption. Today the crater floor is occupied by an ephemeral freshwater lake, recent sedimentary deposits, and minor lava flows and domes from the nineteenth and twentieth centuries. Layered tephra deposits are visible along the northwestern crater rim. Active fumaroles, or steam vents, still exist in the caldera. Tambora's explosion was 10 times bigger than Krakatoa and more than 100 times bigger than Vesuvius or Mount St. Helens. Approximately 100,000 died.